From Derby, Maine to Milo was practically a stone’s throw and by comparison Milo was huge with a population of 2500 when I grew up there in the 1950’s and 60’s. 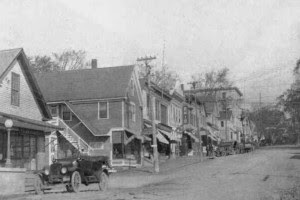 The photo here shows Main Street in 1922 which is about the time both my parents were born, Dad in Derby and Mom in Levant. Since this photo was taken which shows they had electricity or at least the wiring in 1922, one traffic light has been added. Not much else has changed as far as lifestyle except there are very few dirt roads now. The grandparents on my father’s side had 15 children, and Mom and Dad had 8, plus the maternal grandparents had close to 10, so you couldn’t go far without running into a relative. Main Street in Milo was a favorite on weekends and I recall movies at the theater for a quarter and below that a bowling alley that youngsters were not allowed to visit. I can only guess that drinking, smoking, and swearing went along with bowling. I never asked and no one offered details, so I’ll never know. Both the theater and bowling alley are gone now, but not all the fond memories of Growin’ Up in Maine. Small town living in Maine is still my ideal and something I miss.